Two-factor authentication is getting a stronger padlock to further secure your Google account. Currently you can further secure your account by getting a code via text message (or phone call), or with a code from the Google Authenticator app. A new Google prompt adds a third option. You’ll see a simple prompt to approve the new sign-in request. Whenever you go to sign in somewhere new with your Google account, you’ll see a simple pop-up notice to approve or deny the request. The feature will soon be native to Android devices through an update to Google Play Services. On iOS, the approval prompt will come through the Google app. To flip this on for your account, head to the My Account page. 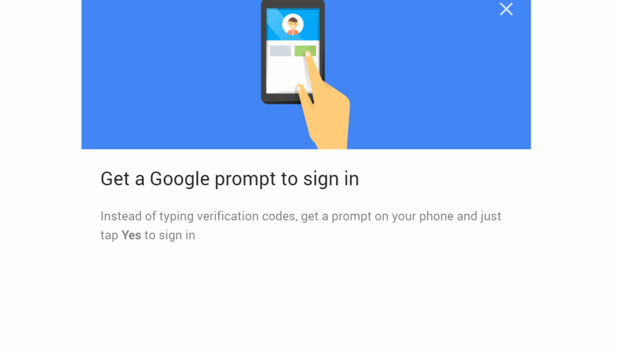 Then, go to Sign-in & Security > Signing in to Google > 2-Step Verification. You’ll then be able to choose from among any active phones. You’ll get a test prompt to verify that everything works, then the Google prompt will be your default method. The impact on you: Two-factor authentication is essentially a must-have feature to protect all that important data saved to your Google account. With this update, the sign-in process is much easier. It’s more secure than an SMS code (which has been subject to exploits) and is faster than launching the Google Authenticator app and typing in a code.